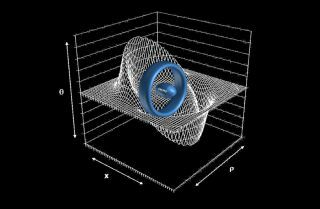 A ring-shaped warp-drive device could theoretically transport a football-shaped starship (center) to effective speeds faster than light. The concept was first proposed by Mexican physicist Miguel Alcubierre in 1994. Scientists, engineers and exploration advocates will gather in central California this week to help plan out humanity's journey to the stars. The action is happening in Monterey Monday through Wednesday (Aug. 7 through Aug. 9), at a conference called Starship Congress 2017. "Our question for Starship Congress 2017 is what role the moon can play to catalyze humankind's venturing forth to explore interstellarly," conference organizers wrote in a description of the event. "Furthermore, this year's theme builds on a key take-away from the Starship Congress 2015 summit at Drexel University: In order to make interstellar space exploration interesting to everyone, what must we do to make space accessible for everybody?" Space.com's Mike Wall will be in attendance, keeping tabs on the most exciting developments.